Le Modalert 200 mg is used to help people with narcolepsy, obstructive sleep apnea or sleep disorder. Cernos Gel is used for replacement therapy in endogenous testosterone deficiency and hormonal secretion problems in men. 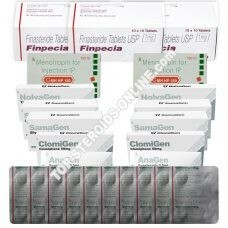 Menodac is used to stimulate spermatogenesis in men with primary or secondary hypogonadotrophic hypogonadism. It is used during post-cycle therapy. This complete pack allows you to protect yourself safely.